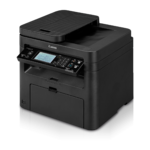 Your professional quality documents are printed at speeds of up to 28 pages per minute1 in black and white with a quick first print time of 6 seconds or less2. Eco-conscious, all mode duplexing right out of the box helps you save on paper and related costs. The tiltable, touch LCD panel allows you to navigate through the menu easily. The wide screen is user friendly and easy to read, and you can also customize your home screen to quickly access your most commonly used features. 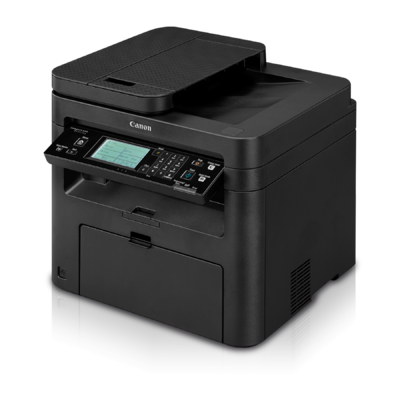 The imageCLASS MF247dw has wireless connectivity7, increasing your productivity and allowing you to print from almost anywhere in your home or office. The device also has built in Wi-Fi® Direct capability8, enabling easy connection to mobile devices without a router. 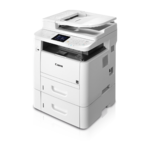 The imageCLASS MF247dw is equipped with a variety of easy to use mobile capabilities for printing on-the-go using your compatible mobile device, such as Apple® AirPrint®10, Mopria™ Print Service11 and Google Cloud Print™12. You can also scan hardcopy originals using the Canon PRINT Business9 app. Easily connect your mobile devices without a router using Wi-Fi® Direct Connection8. Print on-the-go with Canon PRINT Business9, Apple® AirPrint®10, Mopria™ Print Service11, and Google Cloud Print™12. Paper capacity allows for 250-sheets in the standard cassette, 35 sheets in the simplex automatic document feeder and 1-sheet in the multipurpose tray6. 7Wireless performance may vary based on terrain and distance between the printer and wireless network clients. 8Wi-Fi® is a registered trademark of the Wi-Fi Alliance®. The Wi-Fi CERTIFIED™ Logo is a certification mark of the Wi-Fi Alliance®. 9Canon PRINT Business is a free app available on the App Store® and Google Play™ Store. For more information, including compatibility, please visit http://canon.ca/inetCA/en/products/method/gp/pid/43302. Users of Canon Mobile Printing can simply update the app to use Canon PRINT Business. 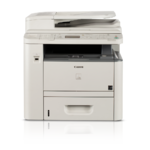 Users who have installed Canon Mobile Scanning for Business should install Canon PRINT Business on their compatible device. 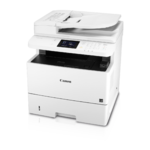 After Canon PRINT Business is installed, users can re-register their Canon Mobile Scanning for Business device list and local documents. Android is a trademark of Google Inc. App Store is a service mark of Apple Inc. iPhone, iPad Air, iPad, iPad mini, are trademarks of Apple Inc., registered in the U.S. and other countries. 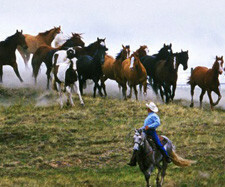 iOS is a trademark or registered trademark of Cisco in the United States and other countries and is used under license. 10AirPrint functionality requires an iPad, iPad Mini, iPad 2, the new iPad, iPhone 3GS or later, or iPod touch 3rd generation or later device running iOS 4.2 or later, and an AirPrint-enabled printer connected to the same network as your iOS device. A printer connected to the USB port of your Mac, PC, AirPort Base Station, or Time Capsule is not supported. 11Mopria Print Service, available for free at the Google Play Store, requires a compatible Android KitKat 4.4 smartphone or tablet. The printer must be either wirelessly connected to the network router or with an Ethernet cable. The mobile device and printer must be connected to the same network. 12Google Cloud Print requires an Internet connection and Google Account. Printer firmware update may be necessary for Google Cloud Printâ¢ function. Certain exceptions may apply. A PC running Windows XP or later or a Mac running OS 10.4.11 or later and USB cable are required to perform firmware update. 13Warranty program is subject to certain conditions and restrictions. See the warranty card for details.